Been working on special since i beat original a while ago. I been playing for a while i think im going to retire this game for a bit. In case you didn't know, the C button in the Special version already acts as autofire, so there's no need for any external autofire button. 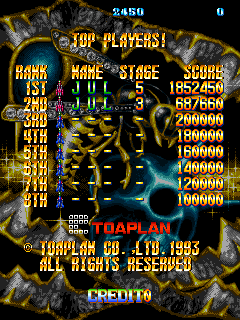 Hi there, I'm now too at Shmups forum. I'm Robin from Germany. I love STGs and especially to play for Score. First game I really got into is Batsugun, which made me to build a Tate setup at home. I just love this perfect rhythm you need in upper loops to prevent suicide bullets. This score I reached in Hey Game Center in Akihabara. I would show an image of the score table, but can't upload attachments yet. Thank you for updating the score table. I got my score end of last year in Hey Game Center in Akihabara. 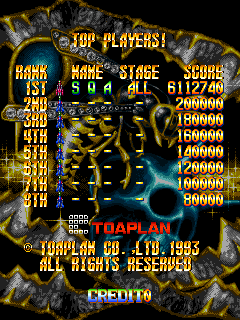 I hope I can improve it soon, but I play Cho Ren Sha 68K first. I got the chance to play the X68000 version a few month ago. In my opinion it's one of the best STGs out there. Thank you that you updated the score table. I had to look twice to realize that this is a Normal score! Excellent work! Any ideas on how to improve this, or will you call it a day after the 20mil milestone? Most impressive! Would love to see a replay if you've got one! I have no idea how the WRs reach 26-27 million, I couldn't get much over 20m even through cheat-assisted savestating so clearly I'm missing something. I had a bad Jupiter fight and lost 2 million, so I'm aiming for 22. I can see how 24 is possible, maybe 25, but 27...I can only guess. It's a big mystery to me and I think KDK must have found a way to time-out Jupiter during his heinous final pattern. <RegalSin> It does not matter, which programming language you use, you will be up your neck in math. I got my first clear of original! Still working on getting consistent enough to fully milk Jupiter. Lackluster first attempt at milking Jupiter. Not destroying that central turret too early with the toothpaste laser can be a hassle. The Coin-Op Table restaurant in Paris has the Special version in one of their cabs, so I gave it a few tries and managed to improve my score. Once you get past the cheap Toaplan-style enemies coming from behind in stage 4 and learn to anticipate them, you can really make a lot of progress given how generous the resources and hitbox are. Wow, lucky to have one in an arcade near you! Yeah, the planes that sneak in from behind on Stage 4 are fairly demanding, as are some tanks that can snipe you from the bottom of the screen in stages 3 and 5. There's not much that's outright nasty or cheap in the game, but the stuff that can catch you even when it's at the bottom of the screen gets pretty tough. Yeah, I can't even realize how cool it actually is to be able to play such a game on an arcade cabinet outside Japan! I usually drop a bomb or two to deal with the stage 4 planes. Once you know they will be there it's a lot easier to fight them. I agree with you on the tanks, they can get surprisingly dangerous. I think it is stage 5 which actually instantly starts with a bunch of these, which is kinda surprising because most stages start a bit more peacefully before picking up the pace. I previously didn't know of the stage 5 enemies you could bomb for massive bonuses or how grazing the pigs could get you continuous points, so that gave a big boost to the score.